I have just posted to my website the first Kurdish novel I have read. Its title, which translates as Sufferings of the People explains the title of this post. Sadly, it is not available in English but only French. I own three other Kurdish novels but, again, they are not available in English, only in German. Kurdistan is one of the several nationalities on my website which is not a sovereign state. In 1976, Wildwood House published Michael Zwerin’s A Case for the Balkanization of Practically Everyone. Zwerin was primarily known as a jazz critic and musician but he did write this one interesting book, long since out of print and, I suspect, little known. It basically makes the case for small nations and that is something I am very much in favour of, hence my support of them on my site. There is a good example of such a nation in Thomas Mann’s Königliche Hoheit (Royal Highness), maybe my favourite nation in literature. The Kurds are one such nation who seemed to have lost out in the post-Soviet Union, post-Saddam Hussein, post-Arab Spring world. There are actually thousands of such nations. While the Jews, Poles and Ukrainians may have been the main victims of the Holocaust, peoples such as the Sorbians and Ruthenians (now Rusyns) pretty well got wiped out. The Kurds in Iraq now have some sort of regional autonomy, though the Kurds are also in Iran, Syria and Turkey, and there is not much chance of those countries giving up territory to form a Kurdistan nation. All of which brings me onto Christopher Hitchens. Hitchens died earlier this week. This is not the place to praise or condemn him. Others have done both far better than I could. However, one thing I would mention is Hitchens’ support of George Bush and Tony Blair’s dirty little war in Iraq. Hitchens supported the war, one of the many reasons he has been condemned, including by me. One of his reasons, however, was his support of the Kurds. 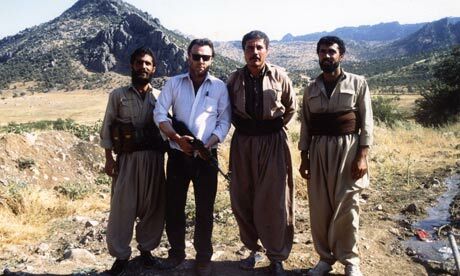 He famously had his photo taken with a group of Kurdish fighters (see below). His support for the Kurds was universally praised , not least because, as sadly so often happens, the new bosses were not a whole lot better than the old bosses. We can argue to death whether it is better to be oppressed by your own kind or colonisers though, obviously, it is better not to be oppressed at all. Hitchens argued that the Kurds did obtain an improvement in their lot after the fall of Saddam Hussein. I am not competent to judge but I will accept that. Sadly, till they obtain full independence with a proper democratic elections, they will still have a lot to fight for. Ahmad’s book shows that the Kurds, like other smaller nations, have suffered a lot. Let’s hope that balkanisation and democratic independence comes their way soon. I frankly find end of the year lists of best books a little tiresome. Firstly, all too often, authors plug the books of their friends, other authors with the same publisher/agent or authors who plug their books. UK satirical mag Private Eye is good at poking fun at these. Secondly, many of them seem to cheer the same book. How many times do we need to be told that A Sense of Ending is the best book? Then you get the author/critic who says that the only essential book is some totally obscure book of Slovenian poetry (only available in Slovenian) which no-one has heard of, even in Slovenia, let alone in the English-speaking world. Yes, we know you are a genius. Finally, and most pertinent for me, most of the books I read in any year were not published in that year. I notice, from my website, that I seem to have read thirteen books published this year, all but one originally written in English. This is probably a record high for me. Having said all that, of course, I do enjoy a sneak look at what the authors and other pundits are recommending, partially to agree, partially to sneer. I like the idea of combined lists. Fimoculous used to do lists of lists and not just for books but apparently has had enough. This year, the novelist Ivan Thays, in his wonderful blog Moleskine, gives a list of lists, mostly taken, as he states, from that other wonderful blog The Literary Saloon. It is an interesting bunch, though I have come across a few other interesting ones, which I looked at but did not note. Maybe I will try such a compilation next year. But then maybe I won’t. The sad thing is that, this year, as far as I can tell, there has not been any great novel published, though there may have been one we failed to notice and only become aware of in a year or two. Which is why I tend to ignore best of lists. As for the books on the lists, I have found that new books by the tried and tested authors have been sadly lacking. But I have probably not yet read the worthwhile ones and won’t do so for a few years. Christa Wolf died yesterday. You can find links to obituaries in both English and German on the Christa Wolf page on my website. She came in for a lot of criticism, firstly because it was discovered that she had worked as a Stasi informer and secondly because she had opposed German reunification. However, it is too easy to sit comfortably in the West (and, yes I do mean both the general political sense of the West, as well as West Germany) and criticise her. Let us not forget, as a teenager, her family fled the advancing Soviet army (she was born in what was then Germany but is now Poland). Moreover, though she did work for the Stasi, she soon withdrew. According to this article (in German), she prepared just three reports, all of them generally positive. The Stasi, not unsurprisingly, criticised her reporting for Zurückhaltung und überbetonte Vorsicht (restraint and excessive caution). Thereafter, she herself was under surveillance. As for her opposition to reunification, shared by other writers, she (and the others) felt that there should be a true social democracy in Germany and West Germany certainly was not it (nor, of course, was East Germany). She hoped, probably very naively, that East Germany, after the fall of Communism, could become a true social democracy. It is highly doubtful whether this could ever have happened but there is no doubt that her fear of capitalism and its consequences seem to have been borne out in recent months. There continues to be criticism of Wolf and, as she is reassessed after her death, there will undoubtedly be more. I would argue that it is not really justified and that she should be remembered for writing three first-class novels – Der geteilte Himmel (Divided Heaven), Nachdenken über Christa T. (The Quest for Christa T)and Kassandra (Cassandra), all of which have been translated into English. I was reading my favourite Italian literary review, L’Indice, the other day. L’Indice contains reviews of new and recent books and articles, a bit like the Times Literary Supplement or the New York Review of Books. One thing that struck me was that a significant number of the reviews had English words in the text. These were not English words as used in Italian but straightforward English words. Most of them were not translated. For example, one review quoted extensively from The Rime of the Ancient Mariner, with no translation into Italian, though the poem has been translated into Italian. Can you imagine a review in an English-language publication quoting from La Ginestra in the original Italian without translation? I am certainly not pointing out anything original here in saying that even educated readers from the US, UK, Australia and other anglophone countries do not have a good grounding in foreign languages. Yes, they know the words they have seen in ads (e.g. Fahrvergnügen), the words in the news (e.g. bunga-bunga, though it probably is not of Italian origin ) and, of course, the standard foreigns words that have crept into English (e.g. fait accompli). Many Brits will have a basic grounding in French while some US nationals will have a basic grounding in Spanish but, on the whole, it is no secret that most of us do not really bother with foreign languages. The reasons are obvious. Everyone speaks English (they don’t but we like to think either that they do or ought to do so). Stuff we need to read is generally available in English and, if it is not, we probably do not need to read it. Your average educated Swede, for example, knows full well that s/he will have to learn English to read much of what s/he wants to read. And when we go on holiday or even meet them in our own country, if we shout at them loudly, they will generally get the message, even if they don’t speak English. There is an apocryphal BBC weather report which allegedly stated “Fog in Channel; Continent Cut Off”. Despite our somewhat reluctant membership of the EU, we still do not really feel ourselves part of Europe, as recent rumblings over the Euro crisis have shown. The US is even more isolationist, as the Tea Party has shown, despite the fact most of them come, originally, from somewhere else. In short, all too often, we feel that we can do without them damn furriners and their nasty habits, their nasty religions, their nasty food and their terrorism. Yes, of course, other nationalities have been as jingoistic but probably less so, at least in recent years, when it comes to linguistic jingoism. All this is leading to an issue I have noted while doing my website, namely that there are many books that have been written in a lesser known language and have not been translated into English, though they have been translated into other languages. This is doubly unfortunate. Firstly you would assume that the largest audience for most books is English, not just because of the large number of native English speakers but also because many others might read the book in English translation if they could not read it in the original and it was not translated into their own language. Secondly English speakers are far less likely to read books in the original language than some other nationalities, who are more likely to have learned not only English but also another language. How often will you see a book written in another language and not available in English reviewed or even discussed in a UK or US literary mag? Yes, the TLS, to their credit, occasionally does so but I cannot think of many other examples, except, perhaps abstruse academic publications. Looking at the current fiction best-sellers, IQ84 has creeped into the top ten NYT list but it is the only non-US book to do so. In the UK, it is all British and Americans. However, looking at Western Europe, US (and, occasionally, UK) books seem to be found on equal footing with the local works. And most of them, of course, use the English word best-seller. Anyway, enough ranting. There are not enough books translated into English, usually because of cultural reasons towards other languages/cultures and not just because of the ineptitude/reluctance of the publishers, and not enough people learn foreign languages well enough to read other books in foreign languages. I shall almost certainly come back to this topic. Following on from my previous comments on the canon, I would like to say a few words in favour of the canon. 1) The stunningly obvious reason is that it does help us, if we are fairly ignorant of literary offerings, to see what is generally considered great and good. I consider myself fairly well read but I certainly found a lot of interest in Bloom’s The Western Canon. I am unlikely to ever read some of the Greek and Roman writers that he mentions; I have never read (and am unlikely to do so) the poetry of the likes of John Skelton, Fulke Greville, Thomas Campion and Thomas Traherne. I am aware of most (but certainly not all) the others and have at least dipped into many of them. I have a few gripes – why no Prus, for example and there are many gaps in what he calls the Chaotic Age (i.e. the modern period) And if Arabic and India are to be included there, why no Arabian Nights and Ocean of Story? And if Arabic, India and Africa are deemed to be part of the Western Canon, why are China and Japan not? However, these are quibbles, as everyone will have their views on what should or should not be included. The result is that we have list, however imperfect, of what many consider the best books in the Western tradition, though with all the provisos mentioned in my previous comments on the canon. 2) Are there rules for writing a novel? Somerset Maugham famously said There are three rules for writing the novel. Unfortunately, no one knows what they are. Actually, he is not quite right. While there may be relatively few rules (prose fiction of a certain length), there are numerous conventions, involving plot(s), character and character development, milieu, beginning and ending, style and so on. I shall not discuss these, as there are so many and there is considerable disagreement as to what they are. On this site, for example, we have novels that are too short, which are not strictly fiction, which have multiple, separate plots, which have few characters, with little development and which are frankly not novels as Somerset Maugham or others would consider novels. However, those that do break the rules/conventions – obvious examples include Samuel Beckett, James Joyce, Marcel Proust and Georges Perec, though there are many more on this site – have had to learn the rules before they broke them. I am sure that there are some novelists who have written wonderfully experimental novels without knowing much about the novel but I cannot think of them. If we look at the canon, we can have, at least, an idea of what the accepted (accepted by (often white male) academics, of course) rules and conventions are. I would think anyone whose novel reading is limited to Finnegans Wake and other radically experimental novels would be missing a lot of what the novel has to offer. 3) It could be argued and, indeed, has been argued that having a canon excludes many excellent novels that, for various reasons, have been excluded from it. This is certainly true. The temptation for students or others limiting themselves to the canon is only to read those novels in the canon and to ignore those not in it. While I agree that this is certainly a danger, I would think that it is less of one than it used to be, not least because with the Internet, it is so easy to find other sources to guide one’s reading, not least of which is my site! However, this works the other way. However awful The Random House Modern Library Board’s selection of the 100 best novels (left-hand column), it is much better than the Readers’ List (right-hand column) which has four novels by the spectacularly awful Ayn Rand in the top ten and three by the equally spectacularly awful L Ron Hubbard in the top eleven. It would be hoped that the canon compilers (academics) would have enough taste to exclude Rand and Hubbard, even if they do exclude many worthy novels. So am I trying to establish a canon with my site? God forbid. What I am trying to do is to say that we do have a canon and it has some uses and I have included many of what would be considered the 20th/21st century canon on the site (and others will follow – it is far from complete) but that the standard canon is missing many, many works, even some by DWMs, and that I will try to suggest works that should be considered. Over-ambitious? Absolutely but I hope that some people somewhere will find books on here that they were not aware of and read them. The more people read the non-canonical works that should be in the canon, the more likely that they will be added to the canon. The Canon is one of the most controversial aspects of literary criticism. I think that goes without saying. Most of us were first introduced to it at school when we are given a reading list or we learned in English (or French or German or Italian…) class that there were certain standard books that were considered “good” books and all too many, probably the ones we enjoyed reading most, that were not considered “good”. We laboured through Dickens and Balzac and Goethe and Carducci and Lope de Vega, all too often vowing never to read such books again, unless we were one of those swots who actually enjoyed reading such stuff. We were even more exposed to it if we studied a literature-based course at university, while many of our friends were absorbed in Dune or Tolkien or John Grisham or Harry Potter or Georgette Heyer. Some of us may have taken notice of Harold Bloom, litcrit extraordinaire and his seminal book The Western Canon. Bloom’s book came in for a lot of flak, though his choice was fascinating. We can and, indeed, should all disagree with some of his choices but there is no doubt that they are interesting and most, if not all, of his suggestions are worth reading if you wish to be the fully educated, well-rounded Renaissance man or woman. There are several problems with Bloom and other canonisers. Here is my take on this, though I am well aware that my views are by no means original. 1) Bloom and other proponents of a Western Canon tend to stock their list with Dead White Males or DWMs as they will henceforth be known in his post. Nothing wrong with DWMs. Writers like Shakespeare, Dante, Flaubert, Lermontov and many other DWMs wrote some quite good stuff. My website is stashed with DWMs. However, around 51% of the world is not male, probably around 80% of the world is not white and 100% of people (excluding the odd zombie – you know who you are) are not dead. This means the perspective, the experience and the contribution of the vast majority of the world is ignored. Women, non-whites and living people have all produced some very worthwhile reading. While the Canon had long been criticised, it faced its first major, concerted attack with the rise of the feminist movement. Though there had long been a feminist attack on the Canon – think Virginia Woolf, for example – feminist writers, such as Betty Friedan and Kate Millett from the US and Simone de Beauvoir and Germaine Greer from France and Australia respectively, led the way. Soon there was a series of excellent works focussing on women and literature such as Ellen Moer’s Literary Women and Elaine Showalter’s A Literature of Their Own, both of which are still well worth reading today. Publishers then started publishing or republishing writings by women (see my website for examples of women publishers). It wasn’t just women who justly felt excluded but also people of colour, particularly those from former European colonies. Post-colonial literature soon dealt with some of those problems and publishers such as Heinemann, with their African Writers Series, started publishing books from former European colonies. Inevitably the French were better at this, with mainstream publishers such as Gallimard publishing many works from former French colonies. But the DWMs weren’t giving up. In 1998, Random House published a list of the 100 best novel of the 20th century in the English language. The average age of the selection committee was 68.7, all were white and all but one male. Of the 100 books they selected, eight were by women (all white), three by the obvious African-Americans and one by V S Naipaul, a man not known for being at the forefront of the feminist revolution. The 88 novels were by white males, some of whom weren’t yet dead. There were many responses to the list, including, in particular, Erica Jong’s interesting though flawed list (Adrian Mole!) But if the Random House represented the literary canon, then God help us. 2) There are other reasons for opposing the canon. The canon plays it safe, almost by definition. Ulysses was on the list but it wasn’t always, being considered too experimental and too obscene. The experimental, the obscene, the daring, the innovative are going to be excluded and they are the ones that need the promotion. Even now, the really experimental is not going to be included in the canon. 3) I do not include many genre novels on my website, primarily because I do not read many. However, I do accept that some have much to offer. Many literary writers have flirted with science fiction, crime and other genre fiction. The standard canon does not. One of my favourite authors is J G Ballard. Many consider him science fiction and nothing but. This is not the place to explain why he is so much more but suffice it to say that he definitely brings genre and lit fiction closer. 4) As well as excluding women, people of colour, the experimental and many of the living, the canon also tends to exclude the working class. Rohin Mistry wisely commented “Most fiction is about the middle class; perhaps because most writers are from the middle class. Working class fiction all too often is excluded from the canon. 5) The Random House was specifically English-language. Why? Because that is what they know. Yes, they have read the obvious foreign works, from Murakami to Gabriel García Márquez but I am betting that there is a lot of foreign literature about which they are stunningly ignorant and I would bet even more they have not read any books in a foreign language that have not been translated into English. Even Bloom, in his Western Canon, though he included many works from foreign countries did not, as far as I can determine, include any works that had not been translated in to English. Yes, many other countries have their own canons but, in many cases, they include a fair amount of foreign works and, while they might not include works not translated into their langauge, that is partially because so many more (particularly those originally written in English) have been translated into their language. In a future post, I will try and say why I find the canon (partially) helpful and other stuff about the canon. When I decided to do this blog, I vowed to myself that it would not be about literary prizes. There are two reasons for this. Firstly, I am not particularly interested in them though, of course, I do get caught up in the hype for the Man Booker and Nobel. Secondly, other bloggers do this very well so I am not sure that I can add much value. So, as a result, my first four posts on this blog were about literary prizes. My excuse is that a) it was Man Booker and Nobel season and b) that I have strong views on both (as regards process and content). The two prizes are over for this year and, though I may come back to them, in order to comment in general terms, enough of this year’s prizes. So this post will be a start of my explanation of why this blog or, rather, why my site, the Modern Novel came into being. It actually started in 1998 when I first decided to create this site. I was inspired by Martin Seymour-Smith’s seminal New Guide to Modern World Literature. It may have been intended as as reference book but I read it from cover to cover and found recommendations for all sorts of writers I was unaware of or only somewhat unaware of. Of course, the trouble with a book like that is that it soon goes out of print and/or becomes outdated. I kept hoping that he would update it but, sadly he never did. When he died in 1998, it was obvious that he would not publish a new edition and it seemed unlikely that anyone else would take on the task. By this time, the Internet was in full swing and it was clear to me that this would be the ideal way to put this sort of information out. I could never hope to match Seymour-Smith in erudition, energy and writing skills but I could, perhaps, make a modest contribution. I did rather expect to have something going in two or three years but, of course, life got in the way, both professional and personal and it also took much longer than I expected. There are still numerous books that should be on here that are not but I have been persuaded by my significant other that I should go ahead with it, very incomplete though it is, so here it is. Books and authors will be added as and when but I will never come close to matching Seymour-Smith. I would rather have expected that someone else would have done this by now but there are really only two sites that I am aware of that have attempted this sort of effort. This is not to disparage the many very wonderful blogs and other literary sites out there but most do seem to focus on a fairly narrow range of countries and limit themselves to books published in their own languages. The two exceptions are, obviously, Wikipedia (in its various language versions) and The Complete Review. The former needs no introduction though I would just say that, while there are many interesting entries, it can be frustrating, both as regards incomplete entries and, in some cases, clearly erroneous entries. Michael Orthofer’s The Complete Review is without doubt the best site on the web. Had it existed before I started or had I discovered it sooner, I may not have attempted my site but, by the time I did discover it, I was well advanced in design and layout, if not content, so I carried on, not least because two sites in English on foreign literature is still not enough. He seems to read a book almost every day as well as produce a <a href=”http://www.complete-review.com/saloon/index.htm”>a very useful blog</a> every day of the year, including Christmas, Thanksgiving, July 4 and every other holiday you can think of. I suspect that no-one is reading this blog right now, except perhaps a few close friends and family members, but people may read this later, so I will say that I intend, in this blog, to talk more about the site, its whys and its wherefores and discuss such matters as the canon, women writers, why US literature dominates on this site and, yes, maybe even literary prizes. When I set up this blog, I vowed that I would only touch peripherally on the literary prize bandwagon/farce and here I am writing my fourth post and my fourth on literary prizes. A foolish consistency is the hobgoblin of little minds as Ralph Waldo Emerson once said. There have been two burning (?) issues on the topic. The first is the issue of “readability”. 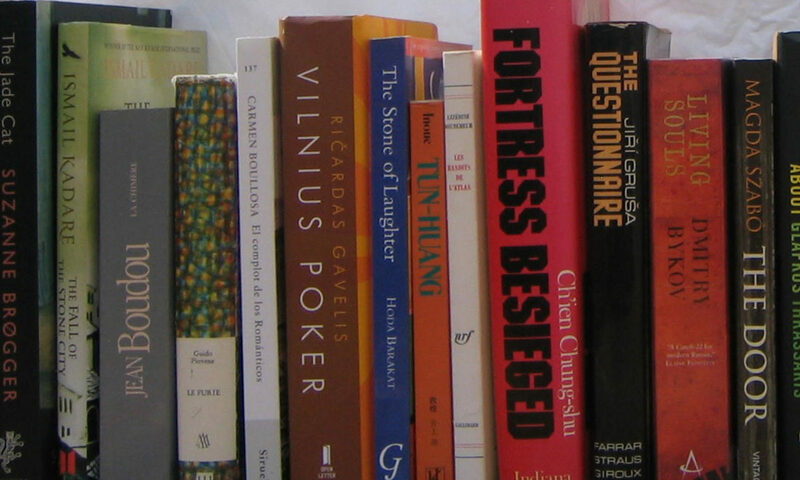 When the Man Booker shortlist was announced, it was said that the were aiming for readability. This raised two issues. Firstly, did this mean that they wanted popular fiction rather than good fiction to dominate the list? And, if not, what did they mean by the word readability ? As usual, Elizabeth Baines summed up the issues admirably. As she points out, if readability is so good and it means books people read as opposed to admire, does this mean that admirable books are unreadable? Well, no she says but, in fact, the reality is that there are many admirable books that readers consider unreadable, including some of the greats such Joyce, Kafka and Proust. There are books that other consider great that I consider unreadable: on my site this would include David Markson and Péter Esterházy. There is nothing wrong in considering some books unreadable, even if that book is by Thomas Pynchon or James Joyce, as has been pointed out. However, do we want our foremost literary prize to award readability or quality? The two are not necessarily mutually exclusive – many readable books on my site are also of high quality. This has been addressed by the announcement of a new literary prize to rival the Man Booker. Literary agent Andrew Kidd is the spokesperson for the prize which, as yet, does not seem to have funding. Will this prize work? Maybe. Maybe not. I was surprised to find in my morning Guardian an interview with Stella Rimington not on spying but on the Booker Prize and in the main section of the paper, not the Review section. Apparently she cannot tolerate personal abuse. Who can? Tony Blair? However, she must be aware that she is in a highly political position (Chair of the Man Booker Prize Committee for this year, if you have sensibly kept away from the all the prizes) but has made some very odd choices. In particular, she and her committee have been roundly condemned for omitting Alan Hollinghurst‘s The Stranger’s Child, a early favourite with the bookies and the public. Moreover, she has been accused of being homophobic for omitting both the Hollinghurst and Philip Hensher. I have not read the Hensher but I have read the Hollinghurst and while it certainly was not bad, it was not a great novel, either. The problem is that many of the likely contenders this year – Anne Enright‘s The Forgotten Waltz, Jane Harris‘s Gillespie and I, A L Kennedy‘s The Blue Book, Hari Kunzru‘s Gods Without Men, Graham Swift‘s Wish You Were Here and Barry Unsworth‘s The Quality of Mercywere less than brilliant, so the Committee had a real problem. I have not read any of the short list and do not expect to. Julian Barnes, I feel, peaked with Flaubert’s Parrot, which wasn’t a novel so I have no great desire to read A Sense of Ending and none of the others inspired me, though I may be persuaded to change my mind. Books sometime can seem better later. They can also seem worse. Maybe this year is just not a very good year, with the English (and Scottish and Welsh and Irish) novel being of the same calibre as their respective rugby and cricket teams.